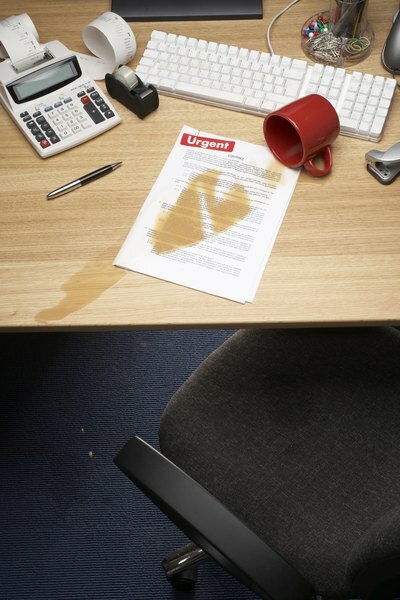 A dirty office can make your business seem unprofessional -- or worse -- can be a health hazard. When your workplace is cluttered, it can clutter your mind, too. Messy indoor surroundings are never ideal, but in the workplace, they can lead to decreased productivity and illness among workers. If you're having trouble getting some or all of your employees to keep their areas clean, attack the problem by making it a group effort. Have a company policy about workplace cleanliness. If it states clearly in your employee handbook that workers need to keep their desks free of clutter -- including those nasty fast food cartons left over from lunch -- it will be less embarrassing to remind the dirty ones that they need to clean up. Just send them an email asking them to read over that section in the handbook -- or send it to everyone as a general reminder, so you don't look like a total meanie. On that note, make sure business leaders are following that code, too; have the office building and its furniture checked on a regular basis to make sure it's not in disrepair or in need of work such as duct cleaning or deep cleaning. Set high standards for yourself. If your own office is a cluttered mess, other people may think that's OK for them, too. Make a point to clean up at the end of the day to keep your area looking tidy. Establish a monthly award for the cleanest office, and broadcast the winners widely. When workers are getting a reward -- even a little one like a coffee gift card or a free lunch -- they'll start getting competitive about keeping things clean. Schedule a regular cleanup day. Sure, it's going to cut into productivity to get all your staff cleaning instead of doing their jobs, but all that clutter and those nasty viruses lurking on desks are already affecting people's ability to do their jobs. Plus, making everyone clean helps avoid the weirdness of singling out the messy people from the clean ones. Before the big day, take a survey of all the things that need to get done, and then make a list of jobs and post a signup sheet in a prominent location. Make it fun -- play music and bring in a catered lunch. Wipe down desks, walls, recycle or shred old papers, and go through equipment that you don't need anymore. Ask your building maintenance staff to help train your employees. If some of your employees are total pigs, they may need some extra prodding to keep the place clean on a daily basis. 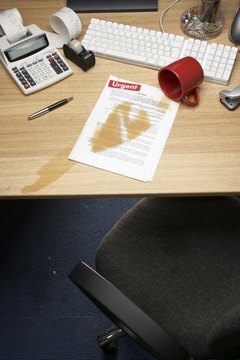 Have the cleaning crew come up with a list of things employees should do before they leave the office, or simply have them come to an employee meeting and give some tips. If you have an employee whose personal hygiene or office clutter is affecting others, the best way to handle it may be to talk to them in private. Schedule a meeting with the employee to talk about how her issues are affecting the rest of the staff, and then work with her to set up an action plan to manage the problem. If she doesn't comply, let her know that the next time you have to bring it up will result in a verbal warning, followed by a written warning. If the problem continues beyond that, you may have to let her go. But whatever you do, don't gossip about the employee with other people in the office -- that's really bad etiquette. If you have mold or other potentially hazardous substances in your workplace, the cleaning is best left to the professionals. Contact a company that specializes in these types of cleanup to deal with the problem -- the last thing you want is to have your employees get sick.